Somewhat obscure, Bongs Away, Left is an unusual and excellent chimney/hand/ offwidth/lieback experience. A featured flake is recessed in a tight chimney with each side 1 to 4 inches wide, so the climbing is intriguing and well-protected. Seldom does Yosemite let you practice such needed offwidth and chimney climbing skills at a moderate level with bomber protection. 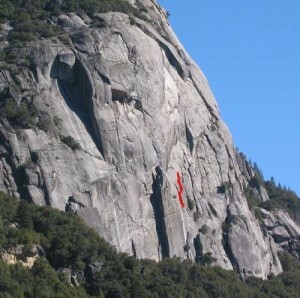 Right off the belay, the best idea is usually to face straight into the chimney and move directly into some of the above mentioned techniques. After exiting the chimney, fun liebacking and cool knobs lead to a bolted anchor. Bomber chickenheads appear now and again and serve as excellent footholds. Rappel 90 feet back to the large ledge, carefully staying left. Which SuperTopo guidebooks include a topo for Bongs Away, Left?